Paul and Silas imprisoned, freed and convert the jailor and family. The jailor ministers to them. *Traditional Paul and Silas bound in jail A great old song which could be a lot of fun; very simple to sing as it's quite repetitive. Good for kids and non-readers. 1935 recording of Josh White (youtube). Lyrics. Good for kids. AoV1-061 / ATOK 355 / GtG359 / SFFS 2194 / G(II)521 / GC723 / GC(II)707 / G(3)814 / ZSS110 / SgTJ1035 Freedom is coming (South African) Excellent and lots of fun, especially if you have a keen African-style drummer in your congregation. It's really worth teaching the parts to your congregation before the service. It can get a bit confusing for the congregation otherwise. Sample sheet music. Good for kids. Taizé / AoVNG125 / MV146 / GC(II)637 / G(3)740 / PfAS024D The Kingdom of God is justice and peace and joy in the holy spirit (Taize) "Come, Lord and open in us the gates of your kingdom". A nice joyful Taizé chant. Sheet music and sound samples of parts for practice. Good for kids. SP&P108 Send your Spirit to set us free (Hamm) A groovy little song. This would be fun to use with kids while telling the story. It could also work as a round, sung unaccompanied. Lyrics and sheet music sample. Good for kids. L4tWC128 A story of freedom (Bock) A dramatic reading of the story for three people. NCH553 / UMH375 / VU612 / WoV737 / ELW614 / HPP379 / GtG792 / PH394 / G(II)460 / GC648 / GC(II)617 / G(3)640 / W&R631 / Cha501 / ZSS114 / SgTJ1045 / 82Hml-676 There is a balm in Gilead (African-American) "If you cannot preach like Peter, if you cannot pray like Paul". This song is not so meaningful for Australians, but I know it is for Americans. It's a good one for those who feel discouraged about anything magnificent happening in their life of faith. Choral arrangement sound sample. TiS 209 / AHB 138 / A&M588 / CH396 / UMH363 / HPP332 / CP(E) 376 / Srce31 / StF345 / MP033 And can it be that I should gain (Wesley) Look, really I've mainly listed it because I like the "my chains fell off!"bit. It's not one of my favourites, and I don't like the idea of each of us pursuing Christ to death, but it's a classic and I know many of you will want to sing it. An oldy-but-really-not-so-goody. Tune in: We are the dream that's longing / Jesus is waiting. An honest catchy rock song about our hesitation to follow and Jesus not only waiting, but continuing to work and change the world. "Come be our liberator, come and set us free". A good sending-out song. Sound sample, lyrics and songbook available here. Cha277 Christians We Have Met to Worship (Atkins) This is sung to the familiar tune HOLY MANNA; the words have been updated a little from the Sacred Harp version. "Is there here a trembling jailor?" Tune In: The Spirit of the Lord (Loukes) A beautiful and simple chant. "To open prison doors and set the captive free". Highly recommended. Lyrics, sound sample and songbook available here. It might be appropriate to sing some modern songs against slavery. It still exists, people! Here's a website with some excellent anti-slavery song suggestions. Online resource Help Us O God to create a new future (Pratt) This song reflects on the slavery of the past, and its continuance, with a call to work until all are "Fully alive". Free sheet music. STB270 O God highest God (Thanga, India) This song from the Mizo people of India celebrates release from slavery. It is not an easy song for Western congregations, but perhaps there is someone in your congregation who could sing it? Pretty exciting and grand Psalm. Taizé / GC(II)533 Sing to God with joyful hearts / Singt dem Herrn (Berthier) A joyful round. Works well in English and German, and probably other languages too. Sound samples, sheet music and lyrics. Cha749 God of all to thee we raise this our hymn of grateful praise Familiar sung response and responsively read Psalm. 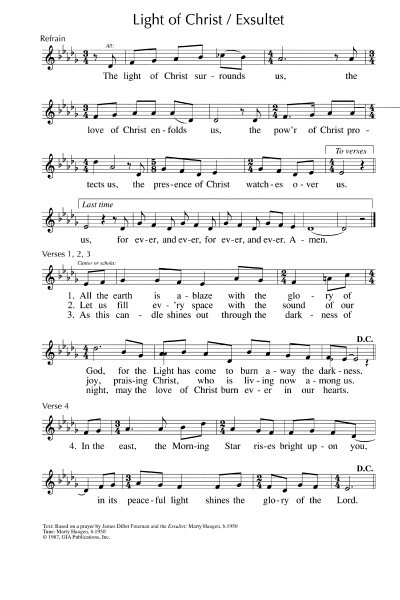 NCH6 / UMH126 / LBW542 / ELW281 / GtG645 / PH483 / URW070 Sing praise to God who reigns above / Sing praise to God our highest good (Schutz) Many versions of this old and easy to sing hymn are not inclusive, but a few are, like PH and NCH. Traditional Bright morning star’s a risin’ Easy old American folk song. Lyrics (multiple versions). Gillian Welch singing it on youtube. I usually like it a lot faster, but this is beautiful. Thanks to Ched Myers for teaching this to me about 15 years ago. ATFG542 / CH480 Word of the Father / Come Lord Come (John Bell) A simple call and response with more verses than you need, adapt them for each week. STB026 Seasons Come Seasons Go / Ella kaladollu (Bhajan) I think this song from India would not be too hard to learn, but it will need to be taught because the melody (THANDHEYU) will not be familiar. The words are really quite lovely, including the English translation. AoV1-039 / GA277 / G(II)257 / Lau081 Come To Set Us Free come to make us your own (Farrell) I like this one. Good words of hope. Will need to be taught, but it's worth it. Lyrics and sound sample. *TiS 780 May light come into your eyes (Treagus) A simple benediction or blessing for someone leaving, or being baptised. *NCH576 / CH706 / UMH428 / VU678 / A&M635 / GtG346 / GA513 / GC719 / GC(II)712 / G(3)803 / CP576 / CP(E) 427 / W&R621 / Cha668 / Lau886 / StF696 For the healing of the nations (Kaan) Excellent words seeking peaceful coexistence of the nations. Can be sung to a range of tunes including the very familiar WESTMINSTER ABBEY. Lyrics and another tune. New words to old tunes. TiS 569 / AHB 478 / NCH18/19 / CH167 / UMH127 / VU651 / LBW343 / ELW618 / StF465 / A&M652 / HPP432 / GtG065 / PH281 / CP565 / CP(E) 455 / W&R501 / Cha622 / 82Hml690 / StF465 / Lau960 / MP201 Guide me O thou great Jehovah / Redeemer (Williams) A rousing hymn of God’s presence and strength and making it to the other side. "Bread of heaven, feed me now and evermore." Sound sample and lyrics. Oldy-but-a-goody. TiS 217 / AHB 148 / NCH43 / CH519 / UMH384 / VU333 / A&M721 / LBW315 / ELW631 / A&M721 / GA463 / HPP48 / GtG366 / PH376 / GC622 / GC(II)613 / G(3)641 / CP485/6 / CP(E) 516 / W&R358 / Cha517 / Srce457 / URW100 / 82Hml-657 / Lau801 / StF503 / MP449 Love divine all loves excelling (Wesley) A beautiful classic song and most hymnals use a very inclusive version of this hymn, even the AHB. Lyrics and sound sample. You may also like to give Rend Collective Experiment's version a listen (hard for congregations to sing, but nice for listening). Oldy-but-a-goody. MV019 / StS002 Maranatha Maranatha Come Lord Jesus Come (Skibsted) A very simple chant. You might also like to repeat a chant that you used in Advent if you can remember back that far. GA406 / G(II)356 / GC511 The Light of Christ surrounds us (Haugen) Could be quite nice. Strong words, needs a cantor. Sound sample. Sheet music and lyrics. AoV1-053 / AoVK-82 / GA256 Receive The Light of Christ (Marshall) Simple round "Receive the light of Christ, May (it) shine within our hears, May the Christ Light fill us with joy and peace". Good for kids. Oneness of all believers and lots of Johanine mysticism of God in Christ and Christ in us. *BUC Song Project Sing, Sing with me (Julia Potter) A fun song for kids about being part of God's family. *Online Resource In my father's house (Somerville) A great new song of unity, with an inspiring, and very singable chorus. Lyrics, sound sample, and source. AoV1-130 / NCH444 / SFFS 2223 / HPP495 / GtG300 / G(II)533 / GC735 / GC(II)728 / G(3)835 / W&R595 / Cha494 We are one in the Spirit / They’ll know we are Christians by our love (Scholtes) A classic 60's song of unity and being an example to others. It's still pretty groovy, I reckon. Older version are really masculine. We often syncopate it a bit at Brunswick. Lyrics and pretty silly sound sample. Good for kids. TiS 548 / VU629 / A&M014 / PH340 / CP(E) 415 / W&R418 / SP3 / 82Hml-465 Eternal light shine in my heart I really love this beautiful inclusive and ancient prayer. It is not familiar, but would be beautiful sung by a soloist until your congregation grows to know it. ATW 462 When I consider God's design (Hand in hand) Good words of all creation celebrating together. Tune is good, too. Lyrics. STB045 We Believe Maranatha (Feliciano) This is a good spoken creed with sung responses. The response is a simple two part fugue with a simple sung (almost) drone for the bass. The creed is one developed by the Asian Institute for Liturgy and Music. The refrain could be used for any creed, really. URW134 God wills a full life for us all (Gregory) A communion hymn. Great words sung to the familiar tune AZMON; The first 3 verses could be sung before communion, and the last two afterwards. New words to old tunes. "Thanks be to God for faith renewed and unity restored. We go, one world, one family, to live Gods' loving word". Recorded Music One (U2) For some reason, we listened to the Johnny Cash version of this a while back, and we thought that it could be interpreted as a song about the unity of the church (even though it's about the reunification of Germany). "One life with each other; Sisters, Brothers. One life but we're not the same, We get to carry each other, carry each other. One"